The Pensacola Civitan Club honored Cathy Harris, left, with the “Citizen of the Year” Award; Cristy Rush, center, with the “Spirit of Life” Award and Charles Stavely with the Community Business Award on Wednesday at the club’s annual recognition banquet and luncheon at the Pensacola Civic Center. The Pensacola Civitan Club celebrated its 42nd Citizen of the Year award ceremony Wednesday afternoon and recognized three outstanding members. 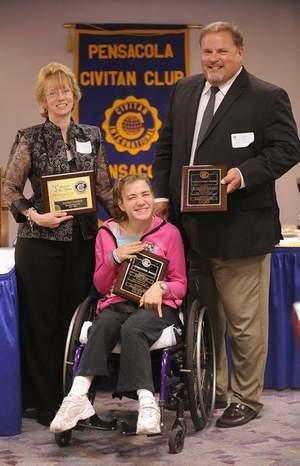 Cathy Harris was named Citizen of the Year. Harris, who works overnight shifts at the Sacred Heart Neonatal Intensive Care Unit as a registered nurse, is the president and founder of Streets and Lanes Ministry. The nonprofit organization helps the poor and homeless spiritually and physically. "They have such a rough exterior, but you can slowly watch their hearts softening," Harris said. "They keep me inspired. Love motivates and moves them just like it moves us." The Commitment to the Community Business Award went to Charles Stavely, a Pensacola dentist. Stavely, who started his practice in 1986, is part of a program that provides dental care to patients on Medicaid waiver. Many of Stavely's patients have cerebral palsy and cannot pay for dental care without funding from the Medicaid waiver program. He has been serving special-needs patients for 15 years. "It's developed into a mission for us because we get so much out of it," he said, crediting his staff for their work. Stavely has traveled to Costa Rica, Jamaica and Panama on dental mission trips and does free dental work for members of Pensacola Teen Challenge. The Spirit of Life Award — which honors people who have overcome disabilities to be productive and exude great spirit —was given to Cristy Rush. Rush was born with cerebral palsy in 1987. Doctors told her family that she would be in a vegetative state for life. Now she walks with assistance and speaks. "She graduated with her class from Booker T. Washington High School," said award presenter Kathy Cotton. "Today she attends the day program at United Cerebral Palsy." Cotton said Rush wants to help others learn to be independent, as well as become fully independent herself. In April, Rush won a regional cheerleading competition in Orlando. She will attend Pensacola State College in the fall. Member Bill Chavis talked to the group, which had about 50 people in attendance, about the essence of citizenship, a concept the award winners personify, he said. "They are changing many lives with one life, and that's the essence of citizenship," Chavis said.